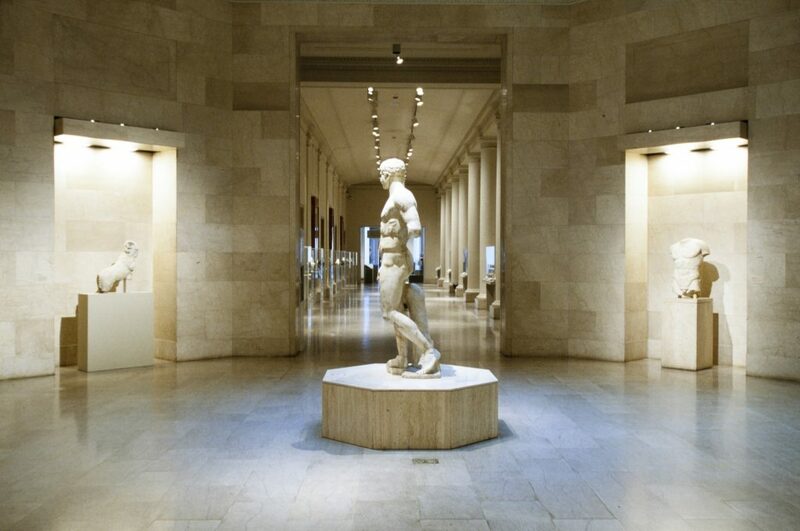 You could try to see everything at the Minneapolis Institute of Art in one visit. Or you could be strategic. 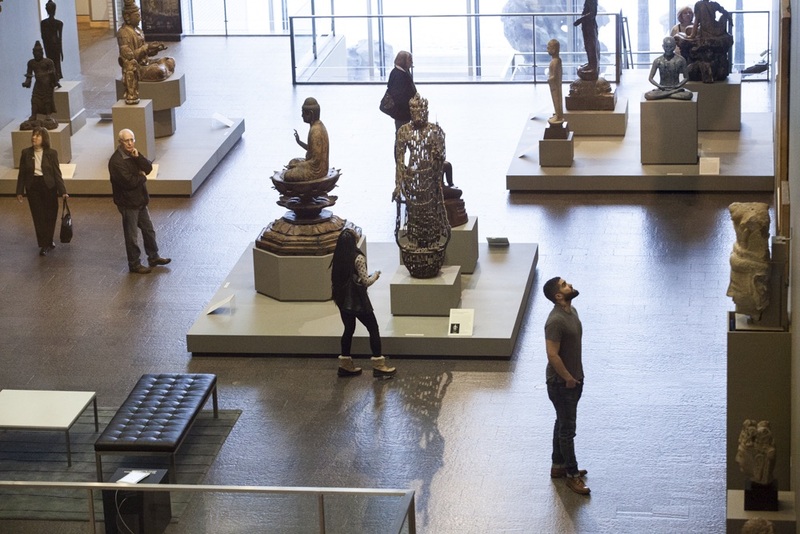 There are 20,000 years and an entire globe’s worth of art in the galleries, after all, and no rush. Here’s how to find what you’re looking for, including art you won’t see anywhere else. The rooms you really shouldn’t miss. The original entrance to Mia, built in 1915, opens onto a mini-Pantheon of Greek and Roman statuary. For the classic museum experience, enter Mia from 24th Street, up the grand staircase, and come face to torso with exquisite examples of Mediterranean art. Why it’s must see: The Doryphoros, front and center, is a marble copy of one of the most famous bronze statues from the ancient world—an advertisement for the sculptor’s elaborate system of depicting the ideal male body. What to look for: The tip of Doryphoros’ little finger. The sculptor based his entire system of anatomical proportion on the length of that digit. Nearby: The Rotunda opens onto the Fountain Court, a balconied hall featuring a wish-worthy Italian fountain from the 1500s. Two rooms and a gate—all that remained of three historic residences—comprise a rare opportunity to imagine life in a traditional, well-to-do household in China. Why it’s must see: The rooms were among the first and finest to leave China after the 1949 revolution, and are now richly appointed with the finest classical Chinese furniture collection in the West. What to look for: The wildly evocative stones in and around the scholar’s study (lyrically named the Studio of Gratifying Discourse) are so-called “scholar’s rocks”—fuel for the poetic imagination. Nearby: A Japanese Audience Hall and tearoom, in galleries G222 and G225, offer a similarly immersive look at life in Japan around the same time. A Rembrandt masterpiece is surrounded by other examples of Dutch painting in the 1600s, one of the great moments in European art. Why it’s must see: One of Rembrandt’s final masterpieces is also one of his most personal, as the tragic suicide of Lucretia reflects Rembrandt’s pain of losing his lover to scandal and the plague. What to look for: The eyes have it. Rembrandt put all the emotion of this decisive moment—despair, resignation—in Lucretia’s teary eyes. Nearby: Lucretia’s suicide allegedly led to the founding of the Roman republic—a familiar story in 1600s Europe. Gallery G312 shows just how influential Rome and its history was on European artists. Get face to face with African objects, recently pulled off the wall and out of cases so you can fully appreciate how they were used and made. Why it’s must see: African objects have often been displayed in isolation, out of context. Not here. Digital tools clarify how Africa interacted with the world, and vice versa. What to look for: The Yoruba shrine head, with its tranquil, lined visage, is a striking, contemporary-looking portrait—despite being sculpted 600 to 800 years ago. Van Gogh, Monet, Gauguin, Renoir—they’re all here, the French rebels who took painting outdoors and forever changed the way we see the world. Why it’s must see: The fresh, personal style of Impressionist painters has remained popular for good reason, and it’s succinctly captured here in representative works. What to look for: The Impressionists were determined to paint the life around them, though their own lives determined the perspective, from Gauguin’s fascination with the South Pacific to Van Gogh’s struggle with mental illness. Nearby: A showcase of post-Impressionism, in Gallery G351, reveals how artists inspired by Impressionism continued to challenge traditions, channeling their perceptions into more abstracted takes on people and places. Intriguing galleries in quiet spaces. At the end of a long stretch of Renaissance and Middle Ages art is one of the museum’s most consistently thought-provoking galleries. Devoted to prints and drawings, the space has explored everything from teeny-tiny engravings to flamboyant male dress. Tucked behind the art of Africa, this gallery has some of the most evocative, spiritual art in the museum, and warrants close examination. The tattooed post figure (poutokomanawa), for instance, once welcomed guests to a Maori communal house, its proportions representing Maori beliefs about different forms of energy in the body. These sprawling galleries show modernism at home in the early to mid 20th century, from cooking (the charmingly efficient Frankfurt Kitchen) to driving (the futuristic Tatra T87). The Curator’s Office, circa 1954, has to be seen to be believed (or not). Overshadowed by Japan and China, Mia’s beguiling Korean art begs seeking out, from the wooden “Attendant to a King of Hell” sculpture to the amiable portrait of an ancient bewhiskered poet who wrote such lines as My mind is like a log turned to ashes. Not all the art is on the walls—sometimes it is the walls. This was once the party room of a well-heeled tax collector in Paris, a glittering gathering spot for the original night owls. It also has a fascinating story of its own, a transcontinental journey from forgotten to fabulous. Recently reinstalled, this airy landing at the top of the stairs gives Mia’s collection of Buddhist statuary room to breathe (deeply). A newly restored wooden gate from a famous Chinese estate now frames the entrance to Mia’s Chinese collections. Overlooking the Fountain Court, this skylit gallery beckons with massive religious paintings and plush seating from which to contemplate them. If you’re after an over-the-top experience, this could be it. Look up. Jennifer Steinkamp’s 6EQUJ5 projection of careening asteroids fills the rotunda ceiling with a sense of playful intelligence—not necessarily of this world. Kick back on the carpet and think about it. Few of Wright’s furniture pieces invite relaxation. But this glass hallway, from a house overlooking Lake Minnetonka west of Minneapolis, offers an airy perch from which to enjoy the view through Wright’s geometric designs. This elaborate device takes the chore out of writing by stashing implements in cleverly concealed compartments. But that’s just the beginning of its mechanical charms. This is the largest piece of jade carving outside China, but the scene itself is enchantingly intimate. In lively detail, it depicts a famous gathering of esteemed intellectuals…holding a drinking contest: have a drink, write a poem. Have a plan for keeping everyone engaged—including you. Mia is a great place to learn about the world’s diverse cultures. But that’s not what you tell the kids. Let the art work its own magic, the demons, mummies, kings, and colors stoking the imagination. Tee up the visit by looking through Mia’s collection online and choosing some areas of interest. Once at Mia, let the children lead by following their interests and attention spans. Talk to each other about what you see, tell stories, and look for favorite animals and colors. All those stories of knights, castles, and princesses come to life in suits of armor and (mostly decorative) weaponry. The Japanese armor is particularly memorable, with its magnificent helmet and bear-fur boots. It begins with a Family Center stocked with creative toys and ends with a vintage three-story dollhouse that once belonged to a St. Paul heiress. In between is art typically created by other Minnesota children and teens. Bonus: private bathrooms. There’s nothing like an immersive environment to fire the imagination. Here, a series of rooms depicting various times and places—England in the Tudor era, France during the Enlightenment—make it easy to imagine life in the past. It would be mesmerizing enough if Lady Tashat were merely a mummy. But she comes with a couple of mysteries, too. How did this teenager die? And why was there an extra skull in her coffin? • Admission is free—every day, all day. But the rotating special exhibitions in Mia’s Target Gallery generally require admission and reservations are sometimes recommended. Check the website to plan accordingly. • Since Mia is free, you’re not obligated to stop at a desk on your way in. But unless you brought your own map, you’ll probably want to. The lines, if there are any, move quickly. And the person behind the desk can tell you about any special events or shows going on that day. • The museum’s Agra-Culture cafe offers great soup and sandwich fare. Two blocks away is Eat Street (Nicollet Avenue), lined with lined with Vietnamese, Mexican, Greek, German, and other ethnic restaurants. • Figure on spending at least two hours at the museum. If you’re coming to see the special exhibition, that will likely be all you do at the museum that day. The museum is free—hopefully you can come back soon. • WiFi is free and strong throughout the museum. Cell service can be spotty depending on the location; the strongest signal is in the lobby facing the windows. 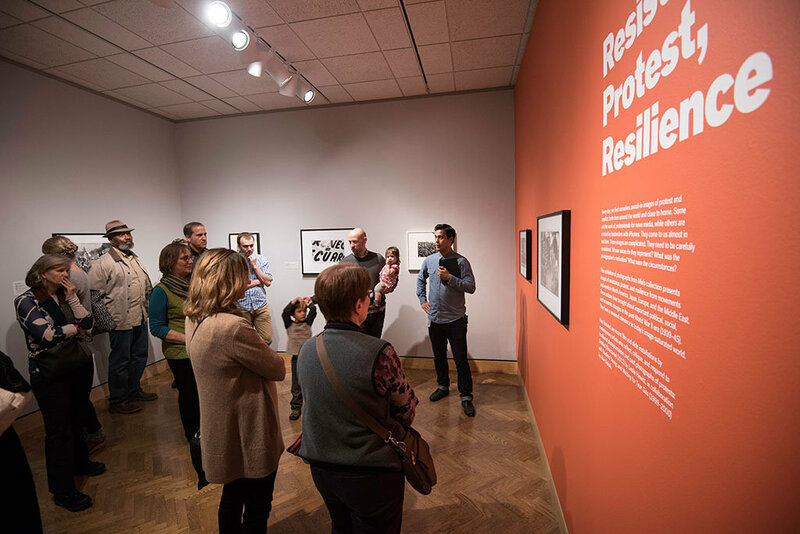 • While in the galleries, visit more.artsmia.org on your smartphone (or check one out in the lobby). The site includes an audio guide to specific artworks and in-depth stories and videos, revealing hidden details and unique insights. • There are gift shops, and then there is the Store at Mia. Curated to feature items as well-crafted as the art in the galleries, the store offers kitchen ware, clothing, home goods, books, and some of the smartest cards in town.